There’s been a lot of media attention on sexual harassment and sexual assault lately, and honestly I’m a bit torn by it. On one hand, I find it kind of cool that people, many of them women, are rising up against people who have sexually exploited them in some way and saying that sexual exploitation is wrong. And I like that! After all, I was sexually harassed at my first job when I was 16-17 years old. And, let me tell you, that was not fun to deal with at all. On the other hand, I fear the mob mentality that such movements can often cause. After all, it is easy to get swept up in the mob! And mobs can be absolutely ruthless. The phrase “mob justice” didn’t come out of nowhere! So, for this blog, I would first like to talk about a sexual harassment case that is found in the bible — the story of Susanna. It’s a fantastic story that is considered scripture by the Catholic and Orthodox Church, though it is considered apocrypha by Protestant sects. Still, while Protestants do not consider it to be scripture, several Protestant sects have asserted that the story is a good teaching tool nonetheless on how to live a more virtuous life. So, let’s take a look at it! 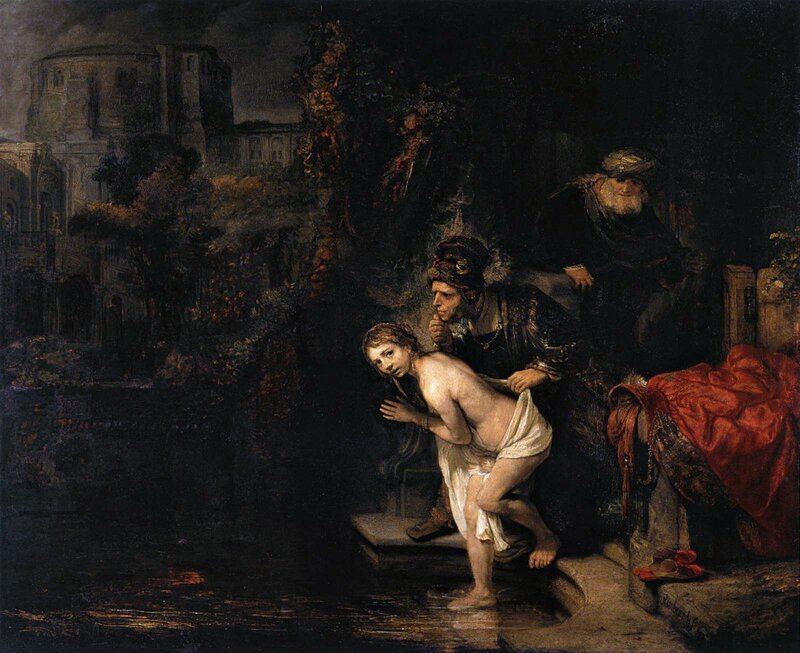 Not only is it an epic story in many different ways, but Rembrandt also painted a fantastic painting that depicts Susanna and the two elders who catch her at her most vulnerable and take advantage of her in a particularly dastardly way. And then I want to talk about how we can move forward, as Christians, by faithfully following Christ. 1In Babylon there lived a man named Joakim, 2who married a very beautiful and God-fearing woman, Susanna, the daughter of Hilkiah; 3her parents were righteous and had trained their daughter according to the law of Moses. 4Joakim was very rich and he had a garden near his house. The Jews had recourse to him often because he was the most respected of them all.5That year, two elders of the people were appointed judges, of whom the Lord said, “Lawlessness has come out of Babylon, that is, from the elders who were to govern the people as judges.” 6These men, to whom all brought their cases, frequented the house of Joakim. 7When the people left at noon, Susanna used to enter her husband’s garden for a walk. 8When the elders saw her enter every day for her walk, they began to lust for her. 9They perverted their thinking; they would not allow their eyes to look to heaven, and did not keep in mind just judgments. 10Though both were enamored of her, they did not tell each other their trouble, 11for they were ashamed to reveal their lustful desire to have her. 12Day by day they watched eagerly for her. 13One day they said to each other, “Let us be off for home, it is time for the noon meal.” So they went their separate ways. 14But both turned back and arrived at the same spot. When they asked each other the reason, they admitted their lust, and then they agreed to look for an occasion when they could find her alone. One of the interesting parts about this story was that this whole thing starts out just because men have “lust in their hearts” and take time out of their day to look at her lustfully. It calls into mind the words that Jesus said that a man who looks at a woman lustfully commits adultery in his heart (Matthew 5:28). Reading Christ’s words makes me flinch — after all, that is a hard commandment. But, Jesus is God, and God knows better than anybody that it’s these sinful desires in our hearts that can utterly turn us wicked. Continuing on with the story! …and, by the way, she is not exaggerating at all when she says that it will be her death if she tries to stop them, since they promise to ruin her by claiming that she was having sexual relations with another man. After all, Mosaic law states that her committing adultery was a death sentence, and if they testified against her, they could very easily get her killed. After all, who is the assembly going to believe? The words of the two respected elders, or the words of a beautiful woman who is desperately claiming that she has been slandered who is quite possibly lying just to save her life? 24Then Susanna screamed, and the two old men also shouted at her, 25as one of them ran to open the garden gates. 26When the people in the house heard the cries from the garden, they rushed in by the side gate to see what had happened to her. 27At the accusations of the old men, the servants felt very much ashamed, for never had any such thing been said about Susanna.28When the people came to her husband Joakim the next day, the two wicked old men also came, full of lawless intent to put Susanna to death. 29Before the people they ordered: “Send for Susanna, the daughter of Hilkiah, the wife of Joakim.” When she was sent for, 30she came with her parents, children and all her relatives. 31Susanna, very delicate and beautiful, 32was veiled; but those transgressors of the law ordered that she be exposed so as to sate themselves with her beauty. 33All her companions and the onlookers were weeping.34In the midst of the people the two old men rose up and laid their hands on her head. 35As she wept she looked up to heaven, for she trusted in the Lord wholeheartedly. One of the things that jumped out at me this time was just how many people were going to be hurt by Susanna’s death, yet how silenced they were because of their shame. They know that the odds of Susanna are doing this are remarkably slim. And they come out to support her, presumably. But, they know that there is nothing they can do about it, so they come out weeping. After all, how exactly are they supposed to convince the rest of the people that she is not the woman that she is portrayed to be? Aha! With the name of God invoked, the hero stands up at last to confront injustice! And, how does he stand up for Susanna? By demanding proof of the elders’ story! This… interplay is hard for us English-speakers to get. In the original Greek, there’s a play on words going on. So when the words are “mastic tree” and Daniel responds with how an angel is supposed to “split” him into two, in the original Greek, the words are “hypo schinon” for mastic tree and “schisei” for cut. Then, with the second elder, the words are “hypo prinon” for oak tree and “prisai” for cut. So, the words that Daniel uses are him turning their words against them, just as he will ultimately do when he exposes their different versions of stories with the rest of the people. As far as the difference between mastic trees and oak trees? Mastic trees are more like spindly shrubs that can grow big, whereas the oak tree can grow quite big! So, basically, you wouldn’t confuse the two with each other. 60The whole assembly cried aloud, blessing God who saves those who hope in him. 61They rose up against the two old men, for by their own words Daniel had convicted them of bearing false witness. They condemned them to the fate they had planned for their neighbor: 62in accordance with the law of Moses they put them to death. Thus was innocent blood spared that day.63Hilkiah and his wife praised God for their daughter Susanna, with Joakim her husband and all her relatives, because she was found innocent of any shameful deed. 64And from that day onward Daniel was greatly esteemed by the people. Ah, all’s well that ends well! As you can suspect, such an epic story has epic artwork. Here’s a picture depicting the scene where the elders catch up with Susanna and threaten her. Susanna and the Elders, by Rembrandt, c. 1647. Gemäldegalerie, Berlin, Germany. And that is a powerful question. Would you choose death over sin, like Susanna? Speaking personally for myself, I’m not sure what I would do were I in her shoes. It would have been so, so easy for Susanna just to give in, let those wicked men take advantage of her, and pretend that nothing evil had happened. After all, if she had done so, she wouldn’t have ever faced the death sentence — for this matter, anyway. And she could just pretend that everything was fine and dandy — even when it most certainly wasn’t. No one would blame her if she did. And yet, she stood against sin anyway. Anyway, the story is satisfying in several ways. First of all, there are clear bad guys and clear good guys who are opposed to each other — the despicable elders versus the pure Susanna and Daniel, who swoops in at the very last minute and saves Susanna’s life — literally — using reason and judgment to show how slimy and evil these wicked men really are. So, the good guys win, the bad guys lose, and everything works out nicely in the end! What can I say? It’s a fantastic story! Still, when we read these stories, we tend to identify with the good guys. For example, when we read about Jesus in His Passion during Palm Sunday, I know that I often was horrified that I was supposed to yell out with the rest of the congregation, “Crucify Him!” After all, I didn’t want to crucify Jesus. I love Jesus! So why, on Palm Sunday, must I say those words that are so odious? I was better than that! And yet, if I look realistically at my life, I tend to side with the mob on many matters. Oh, sure, I might stand off far away from the mob when I disagree with them, but I might not actively try to stop them. And, look at what the mob was ready to do in this case! The mob was ready to disregard Susanna’s words, disregard Susanna’s family, and kill her, even if it completely devastated that entire family. Yet, one heroic man stood up, listened to everyone, and saved Susanna by looking into the matter more thoroughly. That’s all it took. One hero. And because of that, the wicked ones were condemned and Susanna was vindicated. It is not easy to be that hero, though. It is easier to be part of the mob. That’s why we love and value heroes so much. And the answer for that, I think, is in the story of Susanna. In the story of Susanna, there are several sorts of people. There are the wicked men who prey on Susanna. There is Susanna, the victim who heroically follows God and, by doing so, is wrongly accused and now faces death. There is the family, who is shamed into grief and silence. There is the mob who is eager to condemn and kill Susanna. And then there is the hero, Daniel, who listens to the victim, realizes what is happening, and pursues the truth so justice can prevail. And we have to be like Daniel. We have to be that hero. Because, honestly? There are so many wicked people in this world and we need to be willing to fight that evil. My twin brother. He was the first one who really noticed that something was very wrong and the first one who asked me what was going on. When I was having a hard time trying to articulate what had happened to me and overwhelmed with guilt, he acted as my voice and alerted my parents about what was going on in my life so that they were able to understand what was going on and help me. My parents. They brainstormed with me solutions to stop the harassment, when I was honestly having a hard time trying to think through this situation at all. They challenged and quizzed me about my experience, while still maintaining a safe space for me to talk. And they listened. And, finally, another man that I worked with who had some clout with the person who was sexually harassing me. When he noticed that I was having a difficult time, he stopped and asked me what was wrong. And when I told him, he promised he would help me out. And he followed through. And, what did they do? They noticed something was wrong and got involved with this particular mess in my life, though they could have ignored it instead. They listened to me. And then they did whatever they could to help me get through this rough time. And, honestly? They are heroes for what they did. So, do what you can to be a hero. Treat everyone with kindness, without expecting anything in return. Pay attention to the needs of others and do your best to serve them, with the same kind of charity and service that Christ showed us. If something seems off, ask about it. Listen. Offer to be their voice, if they need it. Figure out concrete ways that you may be able to help. And follow through with what you said you would do. I know it sounds stupidly simple and some people would rather punch people in the face than do something as boring as what I described above, but honestly? The mobs are the ones who go out and beat people up. It’s the hero that serves others with charity. After all, is not Christ our hero? What emotions does the artwork personally evoke in you? Have you ever been in a position where you had to choose between living in shame or being exposed and vulnerable? Which one did you choose and why? Have you ever stood up for someone who was in a bad position and needed your help? Thank You for showing us how to love and care for each other through Your example. Help us strive in virtue, even when we are confronted in adversity. Give us the strength so that we can fully care for our neighbors, especially those who are most vulnerable.